I've already mentioned the Tumbleweed people a couple of times in this blog and they really are great with this stuff. So I have the plans from them and have every intention of purchasing the trailer from them as well (since it marries up perfectly to the plans and doesn't require and welding or modification to get started on the build). So, the other day I see that Tumbleweed are pitching an "Amish Barn Raising"...'what might they be referring to?' I wondered. 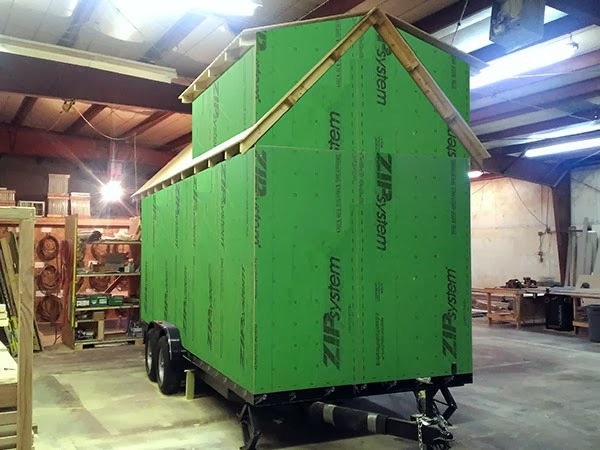 Well, what they are now offering is to have they're contract team of (Amish) craftsmen in Colorado do the primary build of the house shell on a trailer for you. It's kind of like a diamond in the rough at that point and there is still plenty to do to get it completed as well as infinite customization options still available. What this would save me is all the effort associated with the framing and wrapping in plywood of the trailer. Effectively you wind up with something like this. When I took the Tumbleweed course in Philly a few months back they suggested the possibility of using SIPS panels as well to jump start the build process, but this to me seems like a better path really since I'm still a bit iffy on working with SIPS panels. Effectively you get a company to cut the out walls of your house out of single piece panels that are foam sandwiched in between two plywood layers. 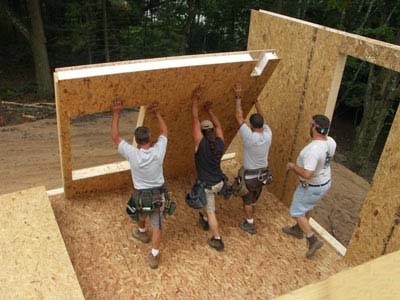 This makes it quick and preinsulated and avoids all the framing work. Tricky though to create plumbing and electrical passages in the material... Might be the right move for some but ultimately not for me.